Twentieth Century Fox Home Entertainment announces Peppa Pig: When I Grow Up on DVD Jan. 22 and PJ Masks: Butterfly Brigade on DVD Feb. 5. With 12 adorable Peppa-sodes, preschoolers are in store for lots of snorts of laughter with Peppa, her little brother George, Mummy Pig, Daddy Pig, and friends! 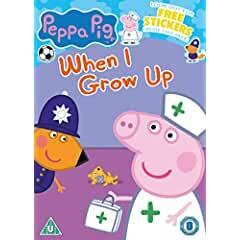 In the DVD’s title episode, Peppa and her friends use their imaginations to decide what they want to be when they grow up, as they work to help others in “The Police,” “Doctors,” and “The Fire Engine”. Later, the playgroup gets excited for showtime! In “Move to Music,” the friends dance along with Madame Gazelle and learn how to play instruments for an oinktastic performance in “Shake, Rattle and Bang”! Preschoolers all shout hooray when they join the trio of heroes, Catboy, Owlette and Gekko, on their nighttime adventures as they work together to stop the baddies and save the day! When Luna Girl pushes her moths aside and steals butterflies to be her new sidekicks, can Catboy learn to make friends with the butterflies and stop her? And Owlette is so amazed by Night Ninja’s new school bus fortress, she forgets all of the reasons why she loves the PJ Masks HQ! Young viewers will enjoy six super adventures in the newest PJ Masks DVD, BUTTERFLY BRIGADE.